Many thanks to Jason Gonzalez, Organized Retail Crime Investigations at Rite Aid for doing an outstanding job of documenting the events of the San Diego ORC Alliance Conference sponsored by USS in California this past Friday. The D&D Daily will continue to report on these ORC Conferences as they occur. 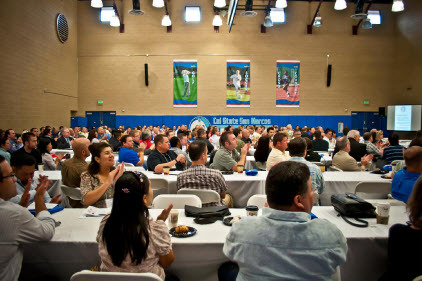 On a bright summer California morning, over 300 professionals in the law enforcement and security industries converged onto the campus of Cal State San Marcos. This group of individuals was seeking a higher education. The topic of the day differed from the typical college curriculum. The day's syllabus was a deep dive into the world of Organized Retail Crime. August 19th 2011, marked the inaugural conference of the San Diego Organized Retail Crime Alliance. SDORCA Executive Director, David Lorillo kicked off the day by introducing several local law enforcement and community leaders, who welcomed the group of enthusiasts. Throughout the day, presentations were made by various investigative and industry experts. The presentations contained a wealth of information that discussed tactics and tools of investigative initiation, investigative efforts, case partnerships and technological options available for combating the ORC epidemic. The United States Secret Service discussed current trends with credit card fraud. A glance at recent investigations and case closure provided a valuable insight to those in attendance. A new understanding of the evolving criminal strategies was appreciated by all. The San Diego District Attorney's Office captured the group's interest, as the successful prosecution of individuals involved in ORC activity was discussed. The documentation and retention of video, as well as witness accounts, go a long way to ensure a successful outcome. Scott Sanford and Glenn Justus wowed the crowd with a glimpse into the efficient and effective case closure methods employed by Barnes and Noble. Through the use of "The ORC Workbench," this group is continuing to drive down shrink and impact profitability. In the current state of the economy, ORC members are growing in numbers. Gang involvement in these groups is no different. An in depth presentation gave the attendees a better understanding into the association of different gangs in the criminal activities that are impacting retailers across the industry. Industry expert, Nelson Harrah CFI, discussed Southern California Transient Theft Rings. Teams of shoplift boosters are displaying the ability to travel up and down the state impacting retail and specialty stores in a number of shopping centers. These groups are even traveling across various states. The key to identifying these individuals is communication and partnerships amongst the private and public sector.